Fall in love with healthy, easy cooking with the most innovative products. Quality, functionality and design that will surprise you with a wide range of tools to make cooking, preparation, preservation, baking and freezing easier. With this collection, Flavor your drinks; season your salads, seafood or other recipes with a light mist of fresh citrus. This set includes 2 pieces for optimum extraction; unit for larger fruits like oranges and grapefruits; unit for smaller fruit like limes and tangerines. 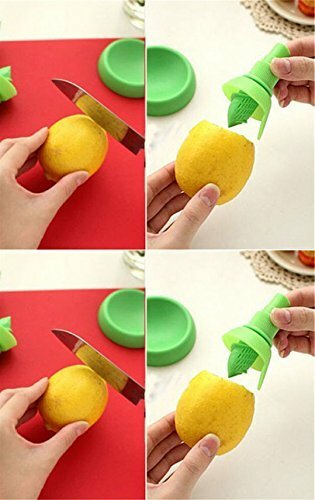 Simply cut a small piece of the peel off of the fruit that is slightly off center from the stem, screw the pointed threaded end down into the fruit, squeeze the fruit gently to fill the sprayers filter and press the sprayer head to release the mist of juice. The citrus sprayer is dishwasher safe, however, it is important to wash it thoroughly to remove all pulp from both the filter and sprayer as this could impair the proper functioning of the citrus sprayer.